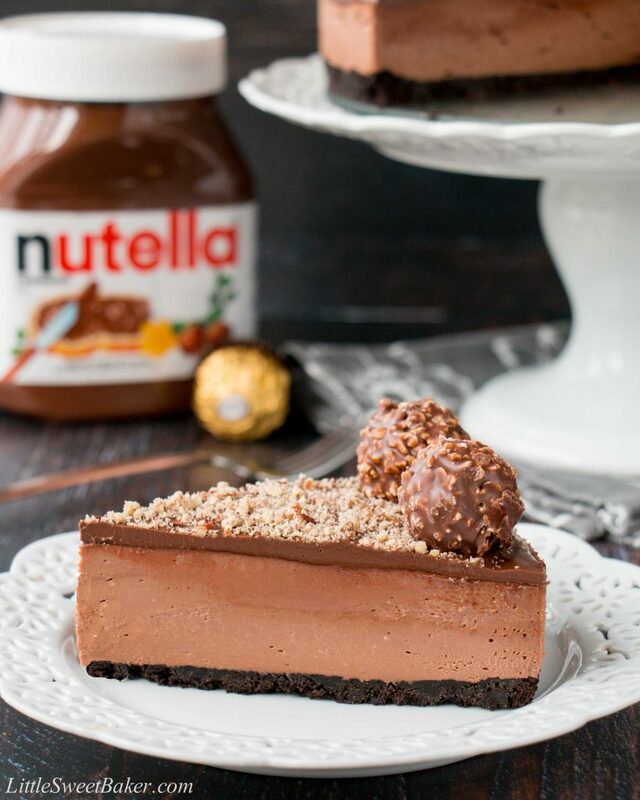 This is a creamy-dreamy Nutella cheesecake with an Oreo cookie crumb crust. 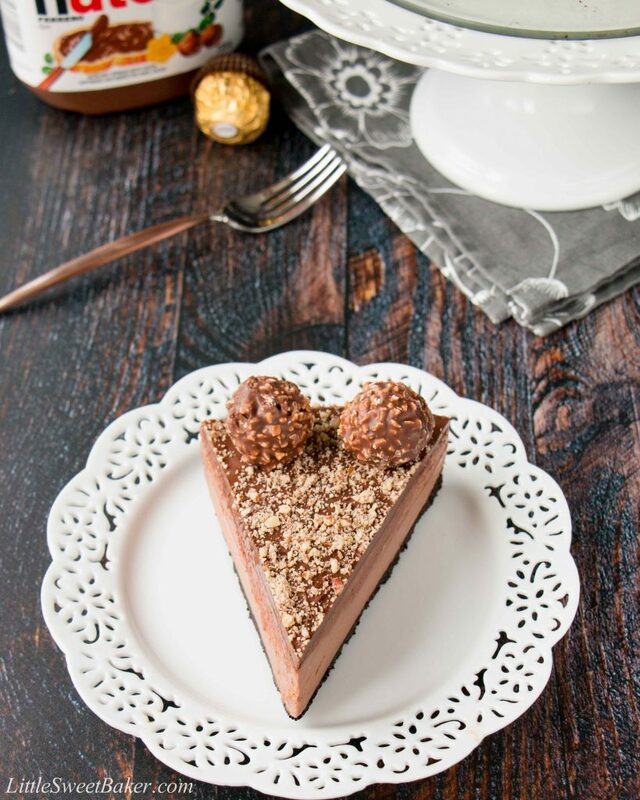 It’s topped with more Nutella and decorated with Ferrero Rocher candies. This no-bake recipe is the easiest and most delicious cheesecake you will ever make! It was my parents 50th anniversary last weekend, so I had to make something extra special. My parents had one of those fairy tale romances. They knew each other ever since they were kids, lived in the same neighbourhood and their parents were family friends. My mom was friends with my dad’s younger sister, and according to my dad, she spent a lot of time at his house and always sat beside him during dinner parties. There were also a lot of shy glances at one another, but the timing was never right and my dad didn’t ask my mom out till the end of high school. When he finally asked her out, my mom accepted right away. They got married 2 years later and had 3 kids. Fast forward 50 years and all 3 of us are married with kids of our own, 8 grandkids in total. We had a wonderful day as a family, although it started off quite comical. We were all supposed to meet at a lovely park to take some family photos, but my parents, the guests of honour, went to the wrong park. So, half an hour went by and we had to get started without them. Luckily, they finally found their way to the same park we were all at. It actually made the day more memorable and we had a fabulous photographer that made the best of the situation. We had some good laughs over the miscommunication during dinner at a local restaurant. There were so many moments where I stepped back to see everyone’s smiling faces. It felt really good to see everyone together having such a wonderful time. The evening ended back at my brother’s place for some tea and coffee and a dessert made with love. This cheesecake is chocolatey, creamy, and smooth, with a nutty taste of hazelnut. The recipe only has 4 ingredients. 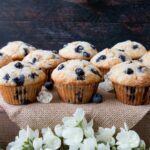 There’s no baking involved, simply mix, chill, and voila! It has the texture and look of a baked cheesecake but without all the work. 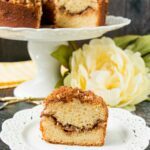 It’s truly one of the easiest desserts I’ve ever made, as well as the most delicious. After all, it had to be the best of the best for such a special occasion. This is a creamy-dreamy Nutella cheesecake with an Oreo cookie crumb crust. Lightly butter the sides of a 9″springform pan and line with wax paper. Mix the melted butter with the baking crumbs, press onto the bottom of the pan, then chill in the freezer. Meanwhile, using a handheld mixer, beat the cream cheese until smooth. Blend in the Nutella until mixture is thoroughly combined and smooth. Evenly spread the mixture over the chilled crust and put back in the freezer for 1 hour to firm up. Warm up the Nutella in the microwave for a few seconds to make it more spreadable and spread on top of the cheesecake. 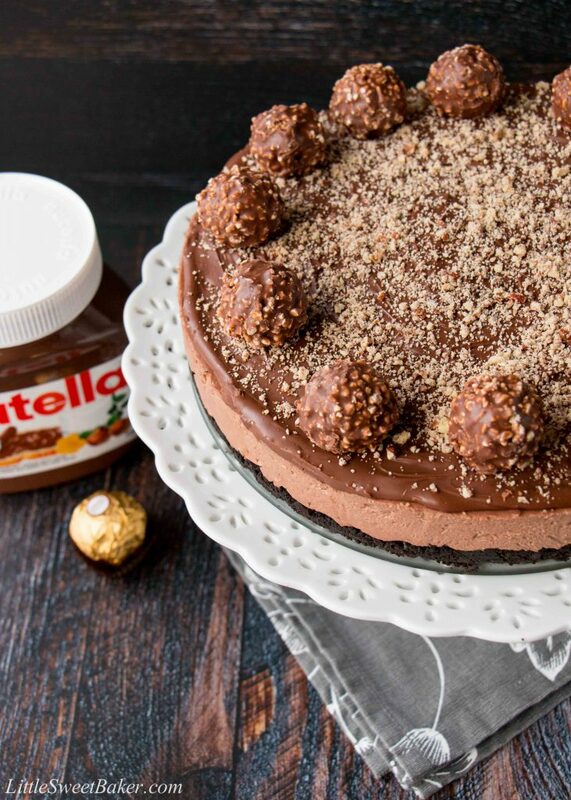 Sprinkle with ground hazelnuts and decorate with some Ferrero Rocher candies. Chill in the fridge for 1 hour or until ready to serve. I made this for my friends birthday and she loved it! 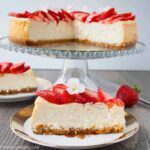 Thank you for such an amazing and easy cheesecake recipe!. This cheesecake is so delicious! I made this with my daughter the other day and she loved decorating the cake with me. We shared the cake with the rest of our family and we all give you 5 stars each! This looks absolutely divine! I love that there’s no whipped cream in there too- less work to do *winky smile* I’m planning to make this in a four inch pan, how much should I scale the ingredients down by? Hi Lily! Your hazelnut cheesecake looks devine! Could you tell me how many ounces of cream cheese is equivalent to 750 grams. Thank you so much! I was just wondering if this cheesecake needs the addition of some sugar because I’m worried it wont be sweet enough or will the topping make it sweet? Thank you. 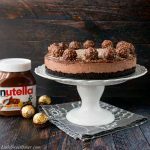 It’s a Nutella and Ferrero Rocher heaven! 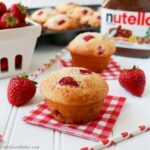 This looks stunning and it’s such a simple recipe! Bookmarking it for an event I have coming up. When you crush the Oreos do you include the creamy bit in the middle? I’m in the UK so it’s not that easy to find all the variations you have in Canada. I don’t think I will find that here so will have to see what I can sub it with…how genius that you can buy them ready crumbed! I will let you know how it goes! !